Global human mobility has garnered greater political attention in the last two decades due to a combination of factors including: the rising (absolute) numbers of migrants, the context in which they integrate in destination countries, the greater evidence of "mixed" migration flows, the circularity of flows and their connection with other transnational movements, and the recognition of the development potential that migrants bring both in origin and destination countries. What is more, as migration policy permeates governance considerations in all countries, so too has the increased recognition of the fundamental role played by local and regional authorities in responding to its challenges. UNITAR offers blended learning courses to local and regional government through its Learning Platform on Human Mobility on the following thematic areas: social cohesion and adapting to change; fostering economic development and entrepreneurship; education and youth development; urbanisation and the environment; access to public services (including health) and human security. Read more. UNITAR in partnership with the City of Barcelona launched the first Mayoral Forum on Mobility, Migration and Development that took place in Barcelona on 19-20 June 2014. A second Mayoral Forum is scheduled on 12-13 November 2015 in Quito. Read more. UNITAR plays a lead role in centralising information on existing training activities and tools in the field of human mobility by managing a comprehensive online inventory through both the Global Migration Group (GMG) and the World Bank KNOMAD Project (KNOMAD). It continues to spearhead reflective work on effective capacity development in this field based on changes in adult learning techniques, and to train on new and emerging issues in the field of migration including protection at sea and migrants in crisis countries. It is also building a comprehensive catalogue of e-Learning courses on migration and mobility within UNITAR’s e-Learning catalogue. 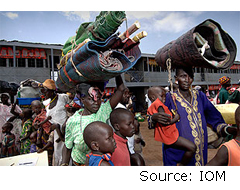 The first to be launched in 2015 with IOM is on International Migration Law. Read more. For more information, contact: Dr. Colleen Thouez, thouez<@>un.org in New York, or Ms. Kato Van Broeckhoven, kato.vanbroeckhoven<@>unitar.org in Brussels.